Konami has confirmed that it is delaying the launch of Metal Gear Survive, the first entry in the Metal Gear franchise since the departure of its creator Hideo Kojima, until early 2018. Announced back in 2016, Metal Gear Survive has a controversial history: It's Konami's first Metal Gear game since franchise founder Hideo Kojima, who created the original Metal Gear in 1987 as a top-down stealth-action game for the MSX2, left the company to form Kojima Productions, and takes a distinct departure from the stealth-focused approach of its predecessors in favour of throwing hundreds of zombies at the player character in order to test their survival skills in the style of Valve's Left 4 Dead and its sequel. 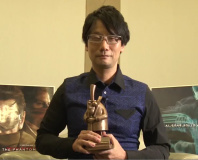 Kojima distanced himself from the title, telling attendees at the Tokyo Games Show 2016: 'That's nothing to do with me. The Metal Gear games are about political fiction and espionage. Where do zombies fit in with that,' he asked, while conveniently forgetting that his 'political fiction and espionage' franchise has included among its cast giant robots, scantily-clad and entirely-silent cheesecake dancing in the rain and excusing her exposed skin with the 'explanation' that she heals through photosynthesis thanks to plant DNA, a character called Man on Fire who is literally a man who is constantly on fire, and the Skulls Parasite Unit which is comprised solely of actual zombies. Now, developer and publisher Konami has confirmed that the game will miss its originally-scheduled 2017 launch window thanks to a last-minute delay pushing its launch back to early 2018. The news was broken via gaming site Polygon, though the quoted Konami representatives gave no reason for the delay beyond a desire for the development team to add final polish to the title. Just a holiday, the company says.